Before another day goes by, we want to thank some pretty amazing people for all their help in making our New Year’s Eve dance another successful event! First, and foremost to the awesome Jessie Hernandez who help out since day one from ticket sales, decorations, set up, gifts for the door prizes, seating guests and everything in between. Jessie, we couldn’t have done this without you. Jessie even drove to Amado to deliver tickets! Thank you Jessie from the bottom of our hearts! 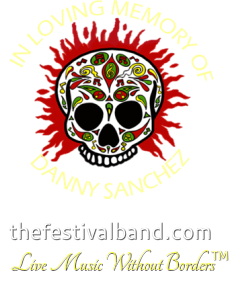 Also to another amazing friend, Linda Sandate, for helping with ticket sales, gift certificates for the door prizes, decorating, helping at the door, serving menudo and everything in between. Ana Mejia, Christina Corral, Jessica Valdez, Sarah Ruiz and Terri Romero who decorated those awesome Mad Hatter hats! Terri, thank you for the beautiful gift baskets also! Susie Acuna and Cindy Gabusi-Martinez, thank you for helping serve the menudo! To Little Mexico Restaurant (George & Pat Palomarez) for providing us with their delicious menudo, and Patricia Mata Peppe for putting together over 300 bags filled with cilantro, onions and lemon! To Kyle Summers for being THE best hotel Sales Manager ever, to Bridget Cunning, Banquet’s Manager, and Marriott Hotel staff for ensuring we had all we needed for our event. We are beyond grateful to each and every one of you. Robert, you did an amazing job with the Mad Hatter props and made the place look WONDERlandFUL! 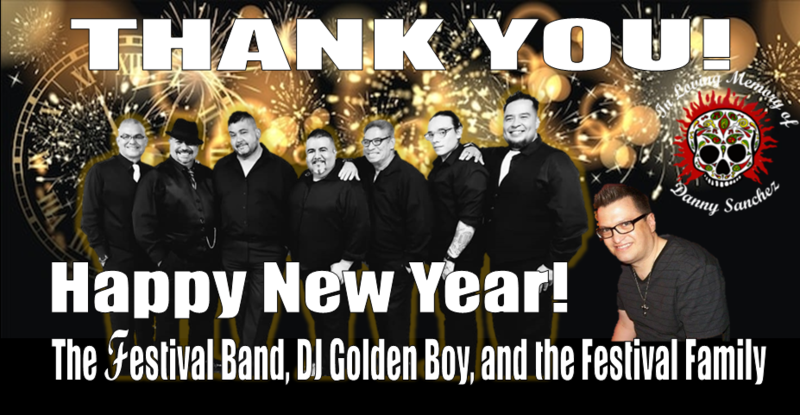 On behalf of The Festival Band, Rick Hernandez, Robert Grijalva, Joe Chavez, Danny Corral, Christopher Trujillo, Carlos Olivas, and Val, DJ Golden Boy (Rene Castel De Oro), and Estella Hernandez we want to thank everyone who attended our NYE Dance. It is because of YOU that everyone mentioned above worked so hard to make our New Year’s Eve a safe place for you to enjoy and have a great time ringing in 2019! We hope everyone had a great time! May this year bring you good health, wealth, happy days ahead, and may your journeys be safe and fruitful! 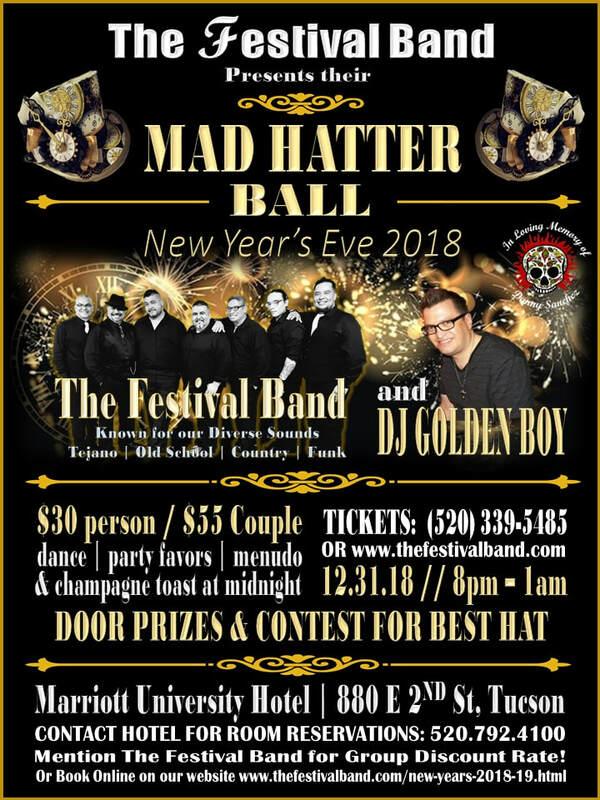 Plan to join us Monday, December 31, 2018 at the Marriott University Park Hotel for our NYE Dance 2018! Dance, Party Favors, Menudo and Champagne Toast at Midnight! The Saguaro Grill (on-site restaurant) will have an All-Night Happy Hour Menu Special on December 31st to enjoy a meal before the dance! We look forward to another great NYE... ring in the new year with family and great friends! The hotel is nestled in the heart of downtown Tucson, just steps away from award-winning cuisine and boutique shopping at Main Gate Square. Enjoy watching TV while lounging on plush beds topped with crisp linens and fluffy pillows. Wake up to a hearty breakfast buffet from Saguro Grill, on-site restaurant, serving American morning classics and locally inspired dishes for lunch and dinner. Make sure to mention The Festival Band's New Year's Eve Dance for Group Rate! ADVANCED TICKETS NOW ON SALE!! Purchase 10 tickets to reserve your table. We will personally deliver tickets to you!